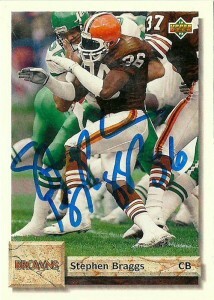 Stephen Braggs quietly entered the NFL in 1987, as a 6th round pick of the Cleveland Browns from the University of Texas. He played 7 seasons in the NFL, 5 of them for the Browns at FS and CB, (where he split time with another former Longhorn, Raymond Clayborn,) and then later with the Dolphins from 1992 to 1993. 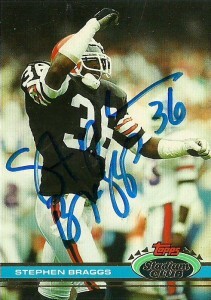 Stephen started 18 games in his career, recording 4.5 sacks and 5 picks. Valued for his special teams play, ability to block kicks and his speed, Braggs was a nice find for the Browns, and a pretty fiesty defensive back for a guy who stands at 5-9, 180. Braggs was the first one I got at the Bowling Tournament. He had a team of coworkers with him who were also getting footballs signed. He gave them a word of advice by saying, “Hit them up as soon as they leave the showroom.” Taking his advice, I promptly walked up to him and asked him to sign 3 cards for me. He smiled and penned them all for me. I then helped his coworkers ask players for autographs when they were too nervous to which they all appreciated. Since football, Braggs has sworn off head coaching stating that he likes to sleep. Currently he’s a defensive coordinator at Harmony, a private school institution for learning. 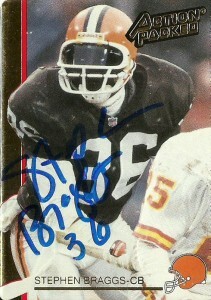 Braggs had actually quite a few cards over his career, and I’m sure I’ll track him down at another event since he is an active NFL and Longhorn alum. In his spare time Stephen (at least used to) enjoy hunting rattlesnakes- a hobby he picked up while at the University of Texas.